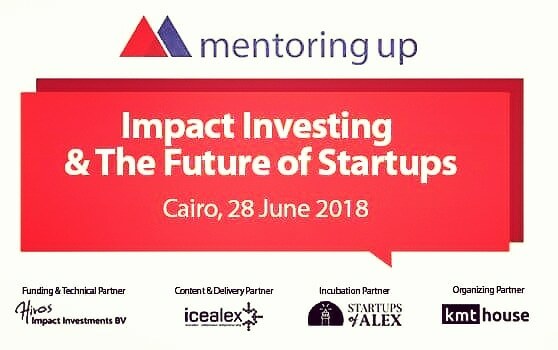 Alexandria, Egypt- June 27th, 2018: The networking event, taking place in Cairo on June the 28th 2018, titled “Impact Investing and the Future of Startups”, concludes the second part of the Mentoring Up activities. As a seed for putting “impact” in investment in the Egyptian ecosystem, the highly anticipated networking event will witness the presence of a pool of active, well-respected investors, a variety of purpose-driven startups and other supporting organizations. It is an honor to have H.E Mr. Laurens Westhoff, the Netherlands Ambassador in Egypt, at the event who will give the opening remarks emphasizing the importance of impact investing and social entrepreneurship in Holland and Egypt. The event will also comprise a panel discussion exploring the impact investments climate and ecosystem in Egypt, additional highlights from the Mentoring Up programme as well as allowing time for the entrepreneurs and investors to meet and network. Ahmed Bastawy, Founder and Managing Director of icealex will be, in his welcome note, highlighting the mandate of icealex to shape the entrepreneurship and maker culture not only locally, but also regionally, as well as the dedication of taking the topic of impact investment further into action collaboratively with different ecosystem key players. The Mentoring Up programme launched in February of this year is a tailored dedicated programme for upcoming entrepreneurs and start-ups which includes mentoring, coaching and guidance activities. The programme has been created in collaboration by a number of partners who worked together to produce a unique and effective programme. The partners notably include, Hivos Impact Investments (HII), who implement the component ‘access to finance’ as part of their Hivos LEAD (Local Employment for African Development) with the Dutch ministry of Foreign Affairs. icealex Innovation Hub is the main local partner. icealex is a community driven technology innovation space with a strong social and environmental commitment. With their main base in Alexandria their main approach for ice activities is to provide an enabling ecosystem for action oriented minds co-creating sustainable solutions for local challenges. icealex begun Startups of Alex, the first Alexandrian business incubator to boost startup growth through enhancing startup sustainability and strengthening the startup ecosystem in Alexandria. KMT as an organizing partner, is a hub for urban innovators and is the beating heart of urban tech in Cairo. KMT House is a gathering place for creative minds and inspiring entrepreneurs where they can think and begin to address some of the challenges in their city. Monique Doppert from Hivos Impact Investments says that the “main reason for cooperating with icealex is because we share the same values”. Thus upon collaborating together Hivos and icealex were able to share and join several of their objectives and goals and include them as part of the Mentoring Up Programme. The tailored programme has been implemented with regards to the objectives of the programme as well as a few other considerations. Providing effective training, coaching and workshops for entrepreneurs, for instance on marketing and finance. Providing individual planning for each entrepreneur, one-to-one mentoring making sure entrepreneurs and start ups are matched with relevant experienced experts and mentors. Increasing the number of jobs created by startups throughout the programme. Encouraging growth and stability in the startups. Keith Wallace, from Hivos Impact Investment, had this to say about the programme’s objectives and the future of the startups, “What I would like to see is companies to have greater turn over, more employees and hopefully some might even earn money from interested parties which could be an investment or grant or could even be a loan because the companies are exceptionally gifted”. Ahmed Bastawy from icealex had these encouraging words and piece of advice for the startups during the programme, “Keep it simple! It can be so exhausting being an entrepreneur but you have to go through the challenges and the roller-coaster ride of thoughts, questions, testing and validating in order to build your product with your customer”. Knowledge Officer – creates a personalized and evolving learning path for professionals to learn based on their career goals. Makanak – is a startup which focuses on car washing using waterless technologies as a way for minimizing water consumption. 7agat – is an innovative startup which creates educational toys primarily for children who have autism. Orca’s – based in Cairo, is a startup which revolves around babysitting. Ehab Darwish from Makanak startup had this to say about a 2-full days programme he participated in as part of Mentoring Up which took place in February 2018, “I believe not to underestimate any event where you can network and meet with other people, so today was a great programme”. Although only a handful of the startups have been mentioned, many more who also took part in the Mentoring Up programme will be attending the networking event as well as a diverse set of other people including not only social and creative entrepreneurs but also impact investors. All the partners including, Hivos, icealex and KMT House will also be present.